UFC 110 took place inside the Acer Arena in Sydney, Australia on Saturday night. 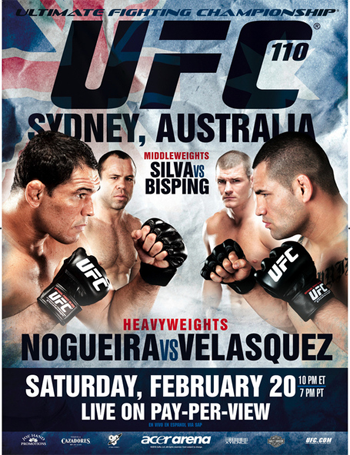 The card featured a heavyweight showdown between the legendary Antonio Rodrigo Nogueira and up-and-coming Cain Velasquez. Velasquez earned himself a vicious knockout victory over the vet as he caught Big Nog with a right hand at the 2:20 mark in the opening round. Once again, we used Twitter to make sure you got the results as quickly as possible. Sotiropoulos catches Stevenson with a left and is starting to time Joe “Daddy” well. Stevenson scores a takedown.